Country French home designs, or French Country homes originated in the rural French countryside and began appearing in residential architecture in the United States in the late 19th century. 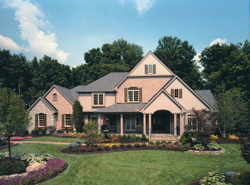 Ranging from charming cottage style homes to large estates, the exterior of French country style homes is characterized by the use of brick, stone, or stucco and steep hip roof lines. Inside these homes, the entries are usually topped with arched openings, and ceilings may have wood beams for a rustic feel. Exuding warmth and charm, they are now a popular choice nationwide. Country French style homes deliver a relaxing, rustic lifestyle associated with the country style home. 1604 Sq. Ft., Width 35'-0", Depth 50'-0"
2124 Sq. Ft., Width 50'-0", Depth 47'-6"
2296 Sq. Ft., Width 50'-0", Depth 52'-6"
Discover French country home designs that feature beautiful interior spaces and stylish floor plans that makes this style have a custom feel. This collection of homes has beautiful curb appeal thanks to the many details on their exterior that often include, wood, stone and stucco.